Dr. Stephan Robert McCandliss is a research professor in the Department of Physics and Astronomy of the Johns Hopkins University and director of the Center for Astrophysical Sciences (CAS). As a principal investigator with the Sounding Rocket group, he works to address cutting-edge problems in astrophysics, using innovative spectroscopic designs. He has launched 16 sounding rockets flights with JHU since 1988, making observations of comets Austin and Hale-Bopp, and ISON, the Io torus, Jupiter, the Dumbbell Nebula (M27), the Trifid Nebula (M20), the Orion Nebula (M42), IC405 and NGC 2023. He has been or is a principal and co-investigator on a number of FUSE, HST, and Spitzer programs to observe atomic and molecular emission, scattering and absorption of far and extreme ultraviolet radiation, along with the concomitant fluorescence into ultraviolet, optical and infrared band, in a variety of galactic and extra-galactic environments. He has hands-on experience with pan-chromatic astronomical instrumentation (far-UV to the IR) and specializes in the development of high efficiency spectrographs and laboratory calibration sources. His research interests range from the metagalactic ionizing background to comets. Stephan McCandliss was September 7, 1955, in Salinas, California. He received a BS in physics and a BS in astronomy from the University of Washington, Seattle, in 1980. 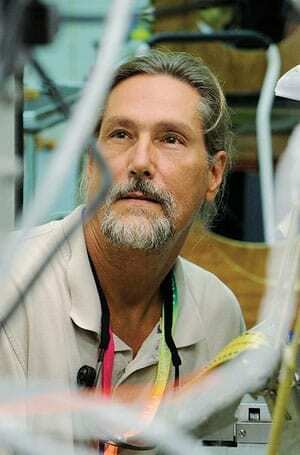 He completed his PhD in astrophysics at the University of Colorado, Boulder, in 1988. He is married to Ann Marie McCandliss and they have two children, Rachel Pearl and Ian Frederick.